We are a coalition of overseas Hongkongers who are organizing a series of solidarity actions to voice support for the weeklong class boycotts and democracy movement in Hong Kong. On Saturday, Sept 27, 9 cities in Bosnia, Canada, the UK and the USA will be leafleting, organizing stand-in or protesting to demand democracy in Hong Kong. Organizers in Berlin will be hosting the event on the following day, on Sept 28. Taiwan’s Mainland Affairs Council Deputy Minister Wu Mei-hung urged the governments in Hong Kong and Beijing to use tolerance. She said that with respect to the Hong Kong people’s desire for universal suffrage, her office and every segment of Taiwan expresses a high level of concern and support. Wu said her office hopes the Hong Kong government and leaders in mainland China can use wisdom, tolerance of different opinions and rational dialogue and other peaceful means to reach a consensus. Lai I-chung, vice president of Taiwan Think Tank, said Hong Kong has lost its appeal for Taiwanese since Communist China took it back from Britain. “I think they’re now looking at Hong Kong as a place that’s a Chinese territory. Since Taiwan democratized and Hong Kong is reverting back to China, Hong Kong is no longer presented as a new place for hope or place for modernity, not a place Taiwan would like to learn from,” said I-Chung. 3) In light of the current crisis, the FCO’s undefined “welcoming”, mere “recognition” and indecisive “hope” are NOT conducive to producing meaningful progress toward democracy in Hong Kong and may eventually be interpreted by Beijing as a green light to do as it wishes. The people of Hong Kong have consistently striven for genuine universal suffrage through different ways over the years. Given the pledge in the Basic Law that China would eventually allow Hong Kong to elect its CE through universal suffrage, and that China has promised to do so in 2017, as a party to the Joint Declaration, Prime Minister David Cameron and the British Government owe a duty to the people of Hong Kong and the international community to monitor and censure China for reneging on this all-important promise now. The Foreign and Commonwealth Office has responded to China’s plans for electoral reform in Hong Kong. We welcome the confirmation that China’s objective is for the election of Hong Kong’s Chief Executive through universal suffrage. The UK’s position has always been that the detail of the constitutional package is for the Governments of Hong Kong and China and the people of Hong Kong to decide in line with the Basic Law. While we recognise that there is no perfect model, the important thing is that the people of Hong Kong have a genuine choice and a real stake in the outcome. We recognise that the detailed terms that the National People’s Congress has set for the 2017 election will disappoint those who are arguing for a more open nomination process. We hope that the next period of consultation will produce arrangements which allow a meaningful advance for democracy in Hong Kong, and we encourage all parties to engage constructively in discussion to that end. As Beijing again violates promises, the world must stand w the people of Hong Kong who deserve a truly democratic election of their leaders. “I want to be quite clear that we are not seeking to interfere in China’s internal affairs. What we are investigating is the FCO’s ongoing assessment of the implementation of the 1984 Sino-British Joint Declaration, under which sovereignty over Hong Kong was transferred to China. That is part of our role in oversight of the Foreign and Commonwealth Office, and it is an entirely legitimate interest of the Committee. We will also consider other aspects of how the FCO handles the relationship between the UK and Hong Kong, such as business and cultural ties. The Mainland’s National People’s Congress (NPC) Standing Committee has rejected pro-democracy activists’ demands for the right to freely choose Hong Kong’s chief executive in 2017, triggering a series of street protests. The Chinese government has a talent for producing precisely the outcome it doesn’t want: whether it’s repressing religion, culture, and expression in Xinjiang so much that tensions now run extremely high, restricting the space for helpful civic groups such that they find it difficult to operate or imprisoning some of its most constructive critics, stifling opportunities for peaceful debate and progress. The recent developments in Hong Kong fit the pattern. 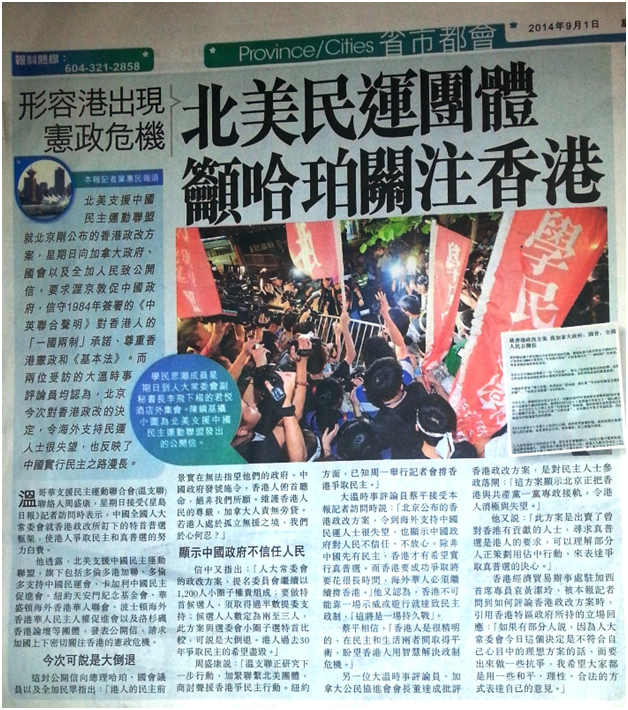 On August 31, China’s top legislative body, the National People’s Congress Standing Committee (NPCSC) handed down its decision: no real democracy for Hong Kong for the near future, and those who most passionately “love Hong Kong and love China” – but don’t love the Chinese Communist Party – will never be allowed to lead the territory’s government. Britain’s parliament has rejected Chinese calls to scrap an inquiry into Hong Kong’s progress towards democracy, a senior lawmaker said, warning that reforms there may violate a 1984 deal on the former British colony’s sovereignty. The Chinese central government and Hong Kong authorities should not impede peaceful protests or other means of peaceful expression, Human Rights Watch said today. China’s top legislature is set to formally announce its decision on Hong Kong’s political reform on August 31, 2014, and the expected announcement is likely to trigger large protests.